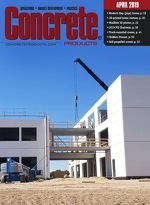 This month’s cover report tours the National Ready Mixed Concrete Co. (National Ready Mix) Vernon plant, near downtown Los Angeles, similar to the December issue profile of Superior Concrete Materials’ Washington, D.C. site (“Capital Investment,” page 40). Both operations will be spotlighted in Las Vegas during a first of its kind World of Concrete 2019 session. Cement and concrete contribute to an impressive recycling story detailed in the American Coal Ash Association’s Production and Use Survey released last month. It indicates that 64 percent, or 71.8 million tons, of the coal combustion product (CCP) volume generated during 2017 was recycled. That represents a new record rate and marks the third consecutive year where more than half of CCP tracked in the United States was beneficially used. Concrete, cementitious material and cement producers using fly ash or lesser residuals accounted for nearly 33 percent, or 23.5 million tons, of last year’s recycled CCP volume.